There was a very full list of fixtures scheduled for lastm Saturday with the first preliminary round of the William Hill Scottish Cup taking place. That involved four of the South of Scotland League Clubs with all four receiving home ties. Edusport Academy met Glasgow Amateur side Coliville FC and managed to hold the visitors to a 2-2 draw with the replay on Wednesday evening. None of the other three teams though managed to overcome their visiting teams and in fact none of them even managed to find the net. St Cuthbert Wanderers played hosts to Edinburgh side Leith Athletic who play in the East of Scotland League and went down by three goals to nil with defender Kyle Fee being involved in all three goals. After holding the Capital side to a goal-less first half a Fee corner just after the start of the second half was deflected into the Saints net by a defender. Fee put his side further ahead after sixty five minutes and ensured victory with ten minutes left. Newton Stewart and Wigtown and Bladoch both had their work cut out to make any impact when they played against two top Ayrshire Junior Clubs, Beith and Auchinleck Talbot respectively. Beith are in the Scottish Cup having won the Scottish Junior Cup while Auchinleck Talbot were West SuperLeague winners and both proved to be formidable opposition for the two Wigtownshire sides. Newton lost an early goal in the 14th minute when Paul Frize rose unmarked from a long throw in to head home just inside the post. Ten minutes before the break the same player scored the goal of the match when he fired in an unstoppable shot to put his side in the driving seat at the interval. The home side came much more into the game in the second half but Beiths keeper was in fine form to deal with anything that the home side could throw at him. Substitutes Darren Christie and Ross McPherson were introduced to the play with both scoring a goal each to give Beith a comfortable passage into the next round where they will face Auchinleck Talbot who beat Wigtown by the same scoreline. With the first half goalless and Wigtown holding their own Mark Shankland broke the deadlock in the 57th minute and six minutes later Steven Wilson put the visitors two goals ahead. The same two players found the net again before the end to put Auchinleck through. 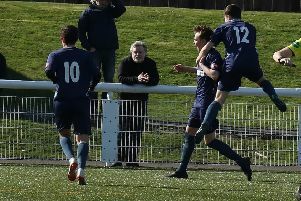 There were four matches played in the South of Scotland League played along with a first round tie of the SCFA Alternate Cup between Upper Annandale and Lochar Thistle that took place at Moffat with the five matches producing a total of 33 goals. Abbey Vale played hosts to Nithsdale Wanderers at New Abbey for a match that was expected to be fairly even but eventually saw the home side run out winners by six goals to three. Vale though were three goals behind after only 20 minutes play with Stewart Campbell finding the net with a single and Kevin Roy scoring a double. Graeme Bell then came to Vales rescue with a brace before the break to bring Vale back into the contest and on the hour mark he completed his hat-trick. Two goals from Dan Thom one from a penalty spot kick rebound put daylight between the teams with Dillon Cairney completing the scoring to give the home side an emphatic victory six goals to three victory. Dumfries YMCA went down by six goals to one against Lochmaben while Mid-Annandale lost their first game of the season when they were beaten by the odd goal in five by Creetown with Greg Jarvie, Stevie Ross and Ross Landers scoring the all important goals for the visitors. Threave Rovers had Heston Rovers as their visitors to Meadow Park and recorded their first league victory of the season in some style when they went nap. Ben Irving gave the home side a first half lead in the twenty seventh minute with Ally Burns scoring a second half double to add to singles from Greg Goodwin and Andrew Forsyth. In the first round of the SCFA Alternate Cup Upper Annandale went down by five goals to two to a high flying Lochar Thistle at Moffat.Craig Muir opened the scoring for Lochar with the home side levelling the match before against the run of play, youngster Jordan Jones struck a low shot into the net to give the visitors a slender half time lead. A second half hat-trick though from Craig Jones ensured victory for Lochar although the home side did manage to find the net for a second. Lochar will now play Abbey Vale in the second round of the particular competition.